love when RJNJ comes in from the garage and says, "I've been working on a lamp." I know that I am in for a treat when I set my eyes upon what he has created. This is his latest (his fourth) red-hot lighting creation. 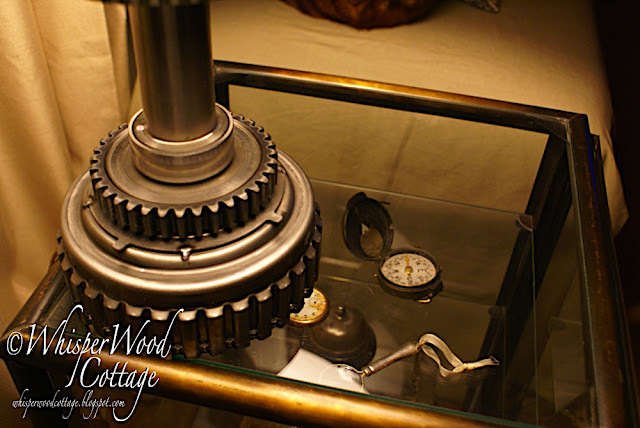 He used Ford motor parts to put this beauty of a lamp together. 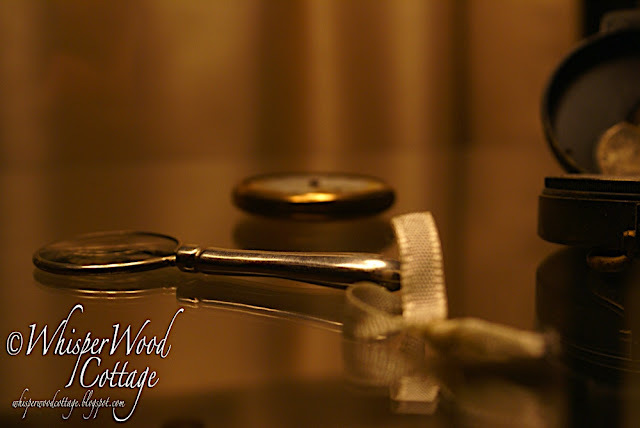 The lamp is set upon a metal display case that I found in Texas about five years ago. 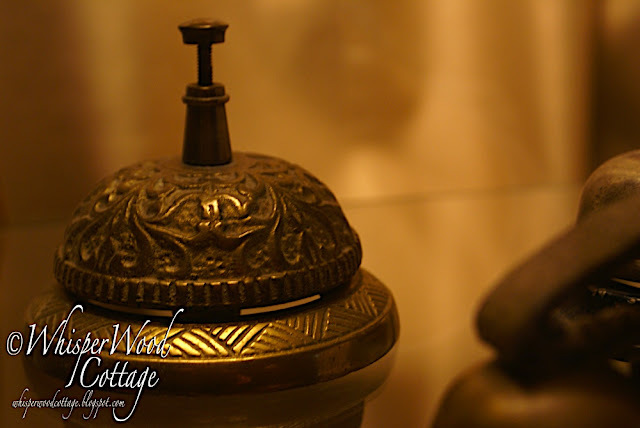 On display are some fun pieces I've picked up here and there...a brass compass, a small magnifying glass, and a vintage bell collection. 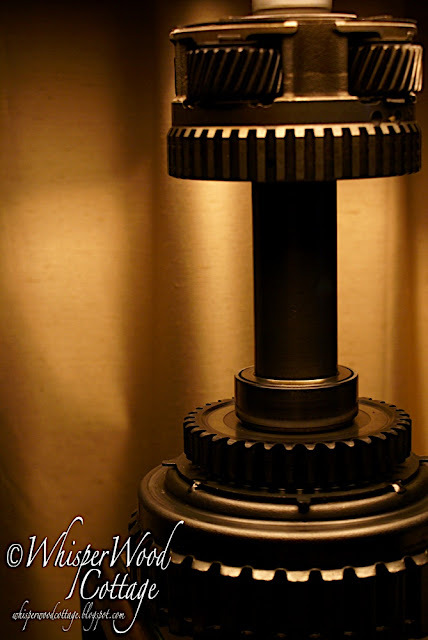 If you want to see any more of the "gear" lamps, here are lamp 1, lamp 2, and lamp 3. 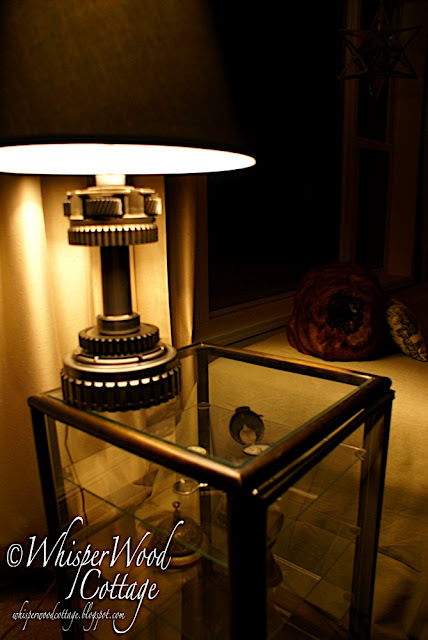 When you start seeing these lamps mass produced with fake auto parts, please remember you saw the original, one-of-a-kind RJNJ creations here first!! So cool! I'm a real lamp junkie -- can't get enough lamps or chandeliers. These are so creative! I'll be they're impossible to part with. Thanks for sharing! Fantastic, as usual! I took a look at the other three again and I must say, he certainly has an eye for design. Tell him 'my' Ron likes them, too! Wow that is really cool, love it! what are we kickn here???? Love it! 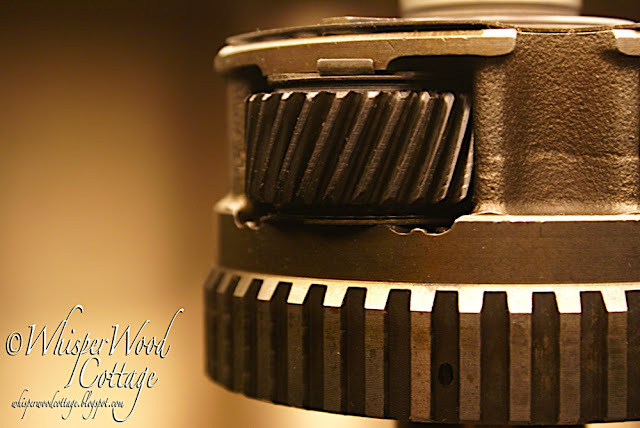 My dad was the manager of a Chrysler plant that made all of the gears. My brother put together a lamp out of the parts back when he worked their in HS...30 years ago. Yours is the first other I have ever seen! Amy, I think you need to take these and sell them at the Bonanza. They are too cool! Tell Ron he done real good! Amy, I would kill to have these in my tent at Zapp...they are wonderful. Only one other thing would make them perfect...where's the man in a tool belt photo? P.S. I also totally dig the hat stand on your other blog. If I could figure out how to get it to Texas, I would ask the price! It is one of the best things I have seen in some time!!! Again, Ron is good! And can I say these photos in particular make me think I can just grab the lamp to get a closer look underneath. Very, very cool. 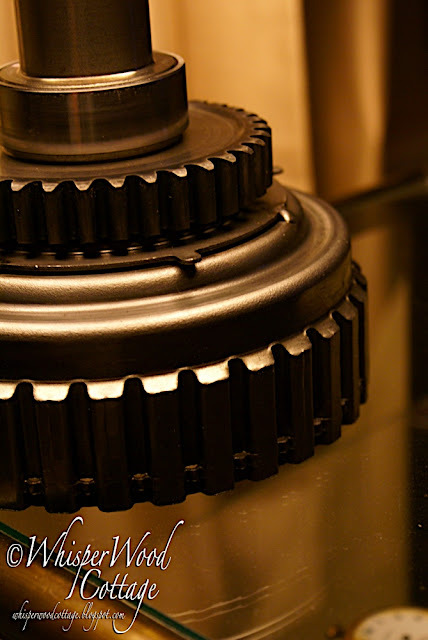 Heehee... love the gear lamp series. 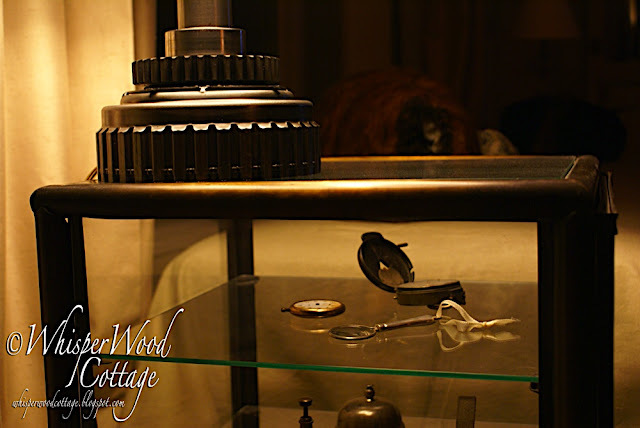 :) You've inspired a friend to put a rusty cog to hold his lamp up too. I'll have to get you a picture. Ron did real good. Lani is right. You need to sell these! It is done very well. I love how it fits right in to your decor. You guys are good! Can't wait to see more. That is awesome, and so one of a kind,, truly! I love creating things for my home that have personal meaning! I love the lamps. They are so awesome and unique. This weekend while I was being lazy, I had Runaway Bride on the tv and Julia Robert's character made lamps from electrical parts and I thought "That's JUST LIKE Mr. ALVN's talent!" haha! Well, similar anyway but it's funny that blog friends and their skills can enter our thoughts just like friends in real life!